In his State of the Nation address, President Cyril Ramaphosa spoke about a new dawn, hope and renewal. Quoting from the song Thuma Mina (send me), by the late South African jazz giant, Hugh Masekela, he asked us to act in pursuit of a better life and a better South Africa. Since Ramaphosa’s election as head of State last month, there is a sense of hope and euphoria in the country. Business confidence is up and the rand has been buoyant since he was elected president of the African National Congress (ANC) in December. This raises some questions about this moment. Has South Africa entered another Mandela moment? Do we suffer from the Strong Man syndrome? Is Ramaphosa the Messiah? Undoubtedly, South Africa under Ramaphosa is not going to be the same as it was under Jacob Zuma. During the Presidency of Zuma, our country went through darkness at noon, as in the novel Darkness at Noon, by Arthur Koestler. In this novel, the revolution, its values and principles are betrayed by former revolutionaries, who run the country. Those former revolutionaries who speak out and act against the counter- revolution find themselves jailed and persecuted. They are regarded as counterrevolutionaries. In an interview with the public broadcaster, hours before he stepped down, Zuma insinuated that he was a victim of a counterrevolution and took no responsibility whatsoever for the decline of the ruling party and the country. He simply refused to accept that he was the reason for the low levels of hope and high levels of despondency in the country. 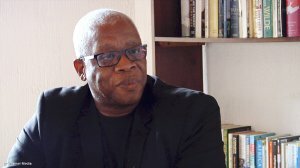 While Zuma may want to rewrite our recent history and cast himself as a hero or victim, the reality that very few among us can escape is the fact that, under his leadership, the bar was set so low that South Africans felt compelled to look for a messiah who would liberate them from the ravages of the Zuma years. Since his tenure as President of the republic destroyed the sense of idealism that came with the Mandela moment of the 1994 democratic breakthrough, I am not surprised that too many among us sought refuge in the nostalgia of the Mandela years. To them, the election of Ramaphosa as interim President is the reincarnation of a magical moment in South African history, the reincarnation of Mandela. South Africans, in their desperation for hope, have succumbed to a need for a strong man in whose hands their salvation lies. This combination of the reincarnation of Mandela, nostalgia for 1994, the Strong Man syndrome and hunger for a messiah is terribly disempowering and may distort our perception of political, economic and social reality. This may cause us to enter into false debates about our politics, the economy and issues such as the call for expropriation of land without compensation. On our politics, there are signs already that we should be less euphoric about the Ramaphosa moment. In my view, his Cabinet appointments betray not his power but the limits of that power. They also amount to an indication of the tension between principle and political considerations. This tension between principle and the political is clearly a function of the balance of forces in the ANC. It is informed by the reality of internal opposition within his party and the fact that, in navigating it, there is a degree to which he must appease his political opponents in the ruling party. But the impulse to appease may not restrict itself to the ANC. It is quite possible that Ramaphosa’s Presidency will be about an attempt to appease competing, opposing and conflicting interests. Added to this is the challenge of mediating conflicts that are internal to his being a political leader and actor. For instance, because of his class position and ideological orientation, he will find himself navigating the tension between what he believes to be the right thing, on the one hand, and the policy positions of his party, on the other. For instance, it is highly unlikely that Ramaphosa is supportive of measures such as the nationalisation of the South African Reserve Bank, expropriation of land without compensation and the amendment of the property clause. Surely, he knows that ratings agencies will never reward radical economic transformation if it is not about the adoption of probusiness and proprofit structural reforms. What he must not do, however, is to allow the situation to arise that arose during Mandela’s Presidency; that is, the attempt to create in him a buffer zone between white fears and black aspirations. What he must not allow are attempts to turn the euphoria about his election as our head of State into a weapon against remembering and becoming numb to the ravages of apartheid colonialism.